When there is a centre, or when a centre is being compressed into existence according to the new cosmology and the Yoga of the Chamber, the action is circular, spherical, because of which simultaneously all levels or all quadrants of the circle divided into 4 are activated and compressed. Only in a spherical operation can all four come into play together, covering all levels of existence: physical, vital, mental and supramental. Formerly the last quarter was termed ‘spiritual’; but after the Yoga of the Chamber brought decisive breakthroughs in the 1980s and 1990s, spiritual is not adequate to describe the nature of the last quarter. This will be made clear further on. In a binary/linear system, pressure can be exerted – as it always has been in the evolution of the species – but we go one step at a time. Survival depends on this method. Otherwise we would have been crushed out of existence long ago. It is a much slower method and the results are always partial. We can only go just so far in such a situation. This describes the boundaries or limits of the mental human species. In geometric symbols we would describe the difference in this way, a pyramid and a circle, A and B. Note that in a pyramidal evolution, while the 4th level, here termed ‘spiritual’, appears to be attached to the 3rd, the mental, in a continuous experience, in the actual practice of yoga there is a disconnection. Mind alone is the tool or channel to reach the summit. This situation forces a rupture and transcendence becomes the only means for access to the last quarter. The process cannot be consciously lived if it is not integral (B) because the energies carried away by the vital and physical leave the system depleted of power. All yogas, up to Sri Aurobindo’s integral model, have to be described as ‘pyramidal’ and transcendental (A). Whatever the sadhana followed, all yogas concur that the Macrocosm is equal to the Microcosm. However, the macrocosm did not come into being on this plan (A); spheres, circles and curves are the geometrical patterns we see all around us (B). The same can be applied to the evolution of the human species. This means that on the basis of the above diagrams we can geometrically display the truth of Sri Aurobindo’s statement that Mind is not the summit; it is only one more step along the way. The quadrants are 4 (B), as they are for Dr Peter Plichta in his spatial geometric plan based on the primary number code he discovered (See www.matacom.com, Update 2, for a discussion on Dr Peter Plichta’s mathematic plan of creation.) However, it has to be noted that the ‘construction plan’ the New Way offers, the Gnostic Circle, combines both time and space, while Plichta’s deals only with space. When pressure is exerted in a linear/binary system, the upper hemisphere is excluded; it is step by step or one layer after another in the above manner (A) and not an integral process (B). Such being the case, how do we ‘go circular’? This is the key question. We cannot do it in isolation of the rest of the species when a certain threshold is reached. That threshold is the 9th Manifestation. This is what is meant by being born as an evolving species, and that the 54,000 years prior to this Age/Manifestation were simply the 9 ‘months’ gestation leading to the ‘birth’ (our times). For this reason a NEW world is born, as the Mother stated. It is not a prolongation of the mental (pyramidal) creation. It is necessarily, in our lived experience, an entirely new world. We graduate from linear to spherical; and Death is no more since it is itself transformed. The experience becomes simply a question of overcoming the pull of Inertia to be able to complete the journey to the summit; and it is a conscious passage through twelve stages covering all four dimensions of being, physical, vital, mental and supramental. This geometric shift, linear to spherical, is what allows for ‘each thing to be put in its place’. It can only happen in an integral, spherical plan. The circle of 360 degrees has to be completed or closed at the 0/9 summit. Until the Supramental Descent of our times, the evolution of the past 54,000 years has not been lived consciously within the full circle in spite of individual breakthroughs. We may not know what came before our cycle, but we do know that this great circle of a total span of 77,760 years is intended to bring evolution through the mental/linear mode to the spherical. The tool is Supermind, the Truth-Consciousness. On the world stage the proof of this statement is 9/11, particularly the attack on the Twin Towers. That was the visual image of the binary/linear collapse that takes place when the dual aspect of Mind reaches the point where it has to be replaced by the circular mode. And if we add the zodiacal script with its progressive movement through 12 stages for a deeper comprehension, we see the Towers as the Gemini hieroglyph `, the very sign related to Mind and Duality. There can be no doubt that once this is pointed out, once the Twin Towers are seen in this light, one can never view the events of 9/11 without this understanding. 9/11 marked the moment of irreversibility for the human species. Is it any wonder then that the numbers 9 and 11 are the full birth counts of the Third and the Fourth in the Solar Line? Due to this event these numbers have taken on an iconic resonance in the collective consciousness. When those 3rd and 4th stages are activated through processes of the Yoga of the Chamber, we experience the Birth. This marks passage to the new world that the Mother spoke of: that linear/binary formula which has governed our world for thousands of years, simply ceased to exist. It evaporated just like the Towers did. 9/11 was the signal that ‘out there’ and not just in hidden chambers reserved for an elite, the shift was made. Linear patterns can no longer hold, only the spherical. This would be the collective experience. But there is the individual to consider as well. The wheel/sphere is one in the Gnostic Circle and we all evolve within that one circle, unlike in the individual horoscope of traditional astrology. Therefore the circle itself has to provide individuals as well with the same new potential. What has been achieved yogically for the entire mental species can be experienced by each of us. The great secret lies in the mysterious Rig Veda and its riddle, ‘the 9 becomes the 10’. The very same circle of 4 is further divided into 12. When one progresses in one’s journey through life and time in circular systems, because of which death no longer exists as an option, as an escape valve as it were, - or for that matter even the salve of nirvana and samadhi – then the 8th stage (death) within the 12 can be traversed without obliteration of the Seeing Eye, without succumbing to the great sleep that is Death. Having stated this, the next step is to reverse the age-old imprint that the species has come to accept as fact: the inevitability of death combined with a heaven beyond this cosmic manifestation. All cultures throughout the world succumbed to this formula in one form or another. All but the ancient Vedic civilisation. Yet the yoga of the Rig Veda did not extend beyond certain boundaries; the time to universalise had not yet come. This is the preserve of the present Age of Aquarius, Lion to Man, Leo to Aquarius. It is only now that the ‘lost sun’ can be retrieved for the entire world and for each individual component – nations and individuals alike. The key lies in the 9 becoming the 10 during the 12-stage journey, the ancient Vedic formula. This passage draws us into the fourth quadrant on this Earth. What has for so long been considered heaven beyond this world is brought down to Earth by this passage. It is a passage of internalisation due to contraction. For the individual the passage is the same that the entire Earth has experienced: linear has to give way to the circular. The reversal requires a concentration of consciousness-force to the point where compression occurs, driving one into a point. The result is the birth that fills the Void: a perfect centre has come into being, consequent of which is an axial alignment emerging from that true Centre, which, in the Mother’s words, casts no shadows. We need to explore the deeper meaning of these words. For this we can use the Mother’s plan of the Inner Chamber; and similar to the visual aid of the Twin Towers, her plan can show us the way. The Mother’s original plan of the chamber describes this passage: the 9 becomes the 10. Foremost to observe is that there are two directions for the chamber’s axial alignment; as there are two for the Earth: her own axis and her position in relation to the Ecliptic. In the Inner Chamber we also note that the two directions are clearly defined: its 24 metre diameter (horizontal), and the 15.20 m descending Ray (vertical). These ‘directions’ meet at the perfect centre hidden in the Pedestal beneath the Globe. These two directions, vertical and horizontal, are time and space. The fact that they are combined in one design is what sets the Mother’s original vision and plan apart from any other piece of sacred architecture the world has known. The descent of the Mother’s vision brought into manifestation two exceptional keys of Knowledge, both of which are ‘written’ in her original plan. One is called the Gnostic Circle. The Mother has given us the plan of that new world. It is spherical. It is whole. It is the structural image of the Gnostic Circle – the new blueprint for the individual, for society, and for the evolving human species. When the birth that fills the Void has taken place and the true centre comes into being, all circumstances of life help to manifest the essence of the centre to which they are inextricably bound. This means that compression of the concentrated power is a circular operation in which nothing is excluded: life’s totality and all the dimensions of consciousness-being, Transcendent, Cosmic, and Individual are compressed into that Point. It is then, after the Reversal, that the centre gives birth to the One and Time then extends in Space the contents of that Seed. What it contains has to express itself; it cannot be otherwise because Time in its spatial deployment is irreversible. While this describes the cosmic Truth it is also the individual’s truth and birthright. And birth in this universe and on this planet alone provides us with the field to live the experience. The great key of Knowledge is the Gnostic Circle for our new Age because it combines the two, Time and Space, in its geometry. The Mother’s inner chamber is the new sacred architecture because it too, by its vertical and horizontal axes and true centre, combines Time and Space. The Gnostic Circle explains the Mother’s creation; the Mother’s plan gives ‘form’ to the Gnostic Circle. They result in 3 + 6 (= 9). In a variety of ways the choices people and groups make, individually or collectively, are exposed for what they are in the light of higher studies. They reflect either a wide and all-encompassing vision, or else a personalised, and by this very reason, a fragmentation that is expressive of the ordinary human condition. In this light there is another interesting anecdote to relate from our historical documentation concerning the Mother’s original vision and plan, which once again reveals that there are no pretences and truth is manifest at all times. It is in the way that Sri Aurobindo addressed his co-worker of the Solar Line. She was always the Mother, with the article. After dismissal of her original vision and adoption of the Auroville architect’s version in the 1970s, simultaneously a movement began to drop the article. She became simply ‘Mother’. Everywhere in print or in speech, in both the Ashram and Auroville, the tendency was to an article-less ‘Mother’. She was thus dislodged from her cosmic completeness and converted into an intimate, loving, and very human creature; but that much diminished by this imposition. Certainly it is worth noting that rejection of her original vision and plan by Auroville was fully in consonance with this diminishing. To experience the Mother, creator of such a superlative vision, as the embodiment herself of the Cosmic Truth, one would have to make a supreme effort to expand one’s consciousness accordingly. It is an accomplishment that requires serious yogic commitment. Sri Aurobindo never sanctioned this custom, yet it gained ground and acceptance pari passu with the construction of the temple. In fact it was propagated by the very group of people who spear-headed the drive to adopt the architect’s model. We have reached the point today where this mode of addressing the Mother has come to distinguish the followers of that camp (the whole of Auroville) as a sort of signature. Some sections of the Sri Aurobindo Ashram still hold out, but they are fast becoming a minority. But let us examine the deeper significance in the development of ‘the Mother’ to ‘Mother’, and in so doing disclose its place in the total context of the Mother’s work where there are no ‘coincidences’. Sri Aurobindo’s name consists of 3 + 9 = 12 letters. The Mother (complete formula) is 3 + 6 = 9. Dropping the article leaves poor Mother dangling with only the 6! This means that the 3 has been eliminated. And it is precisely the 3rd Power that gives birth to the true Centre and the consequent perfect alignment – exactly what is missing in the Auroville construction. No true centre, no perfect alignment – and no luminous Globe, or the Third Power in the Chamber’s Core. 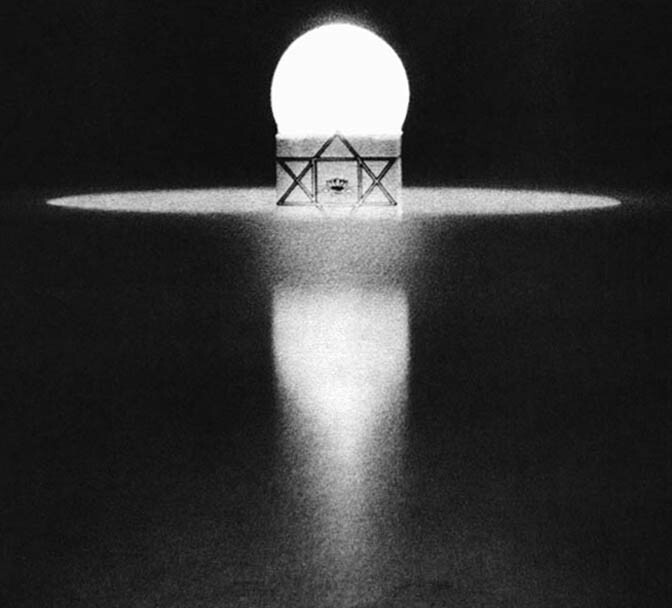 Without the 3 there is no Knowledge (symbolised by the luminous translucent Globe, the only light-filled object in the Chamber) and the Chamber cannot be a conscious experience of the Absolute Truth that is its essence, its core substance. In its present state it may be all things to all people, as comforting as ‘Mother’ surely is. However, in its shadow form it is a reinforcement of that very relativity we seek to overcome as a species, as a civilisation, as individuals. Thus, dropping the article is perfectly in keeping with the Auroville dismissal of centimetres as bearing any intrinsic value. Similar to Dr Peter Plichta’s criticism of contemporary science, to the builders of the shadow temple centimetres also have no intrinsic value. Along with everything else they are thrust into the bag of ‘just coincidences’. And by this reasoning, the gnostic content of the Inner Chamber has been eliminated forever in the Auroville construction. Still we must go deeper. If we really wish to identify with the essence of the Chamber and the realisation it offers, then we have to realise that these obstructors goad us on, as the Mother noted in one of her most insightful revelations (see Appendix). And in this light we note that had the article, or the 3, not been dropped there would have been no struggle to have the Mother’s plan reinstated; and if we could have eliminated that struggle, there would be no revelation of the gnostic content of the Mother’s vision. In other words, it would not have become an APPLICABLE tool of the Yoga. Indeed, there would have been no Yoga of the Chamber at all since the essential ingredient in the process is knowledge and conscious participation. The 3 had to be lost so that this denial would force her unveiling which in itself was the method to bring down the Knowledge. Thus, we have had to live the dismissal of the 3 (and the article – all at the same time) with all its pain, strife and struggle, so that the light could be brought to Earth in its full power, revealing in the process the sublime contribution made by the Becoming as this anecdote reveals, just as the Mother understood four decades ago. For Auroville and its followers ‘Mother’ is fine; it is the way they have chosen and with which they feel comfortable. But for readers of these Chronicles and students of the New Way, she will always be, as Sri Aurobindo envisioned her, the Mother, the combined 3 + 6. The complete Descent is 3 + 6 + 9. 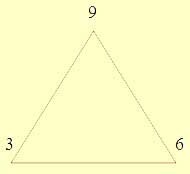 In the New Way one angle at the base of the Sacred Triangle is 6. It is balanced by the 3, the other angle, to equal the Apex, the 9. This is the Formula; this is WHAT IS. We may choose to eliminate the 3 (and the article) and remain only with the 6; but then we chose death, decay and the shadow because the 3 is the integration of the Becoming and it is indispensable in order to transform linear processes to circular. This is the essence of the New Way, and it is the essence of the Mother’s Inner Chamber. Circular processes are necessarily different from the linear. Axis and alignment are the issue, not a horizontal, linear arrow. But to bring this about a centre is required; and to create this centre compression from the periphery is demanded (goading? ), pressing ever inward to a Point. The Mother foresaw that at a certain point hostile forces would no longer be required to create what she has referred to as a pressure of the Consciousness (through ‘crushing circumstances’). Now we must explore other possibilities in light of what has descended after the Mother’s preliminary labour up to 1970. Could a complete reversal of shadow to light be possible via realignment, and could its effects be instantaneous? That would be miraculous; however, in this work miracles, as the term is commonly understood, do not happen. But there can be a gradual almost imperceptible change which is entirely in tune with the nature of this Yoga, when elements that were always there are somehow shifted and in that shifting a new order or harmony is created. Nothing has changed in the sense that nothing is added or cut away. But because of the new alignment, or realignment, things fall into place differently: a higher order manifests. What appears to be a miracle occurs in this way. These are not miraculous interventions, as such, but simply spatial shifts of parts within the whole which allow a sudden adjustment that appears to be outside the natural order. But it is simply a new alignment. Time may be circular but it still flows from day to day. It is the whole that is different, the area of the circle (which did not ‘exist’ before). Then time manifests events from the centre. It is not linear as past to present to future, along a line. It is a manifestation from the centre, and perhaps one should not describe it as evolution any longer. In the new order things manifest, they emerge into the light as a blossoming flower. The flower is always totally there – but time urges its growth (manifestation) from the centre, from within. The Mother’s reflections on Sri Aurobindo’s aphorism describe this experience of a new integration of the Becoming. It is a flowering directly under the ray of a Supramental Sun; and it casts no shadows. This poise comes about only in circular systems; hence the Mother described the Core of her vision as ‘the symbol of the future realisation’, always from within, always centred. This is how time is simultaneous. And in this way a new order comes into being right amidst the old. It is not different or external to what is; rather it is the Becoming that has changed by partaking of the same centrality. The whole is always in existence in a process of enduring manifestation. Very Good! (the Mother laughs) That’s very good. It’s very good for everyone, isn't it? Especially for those who think they’re so superior. But it really does correspond to something very deep. yesterday it seems to have reached its peak, and this morning it developed into a comprehensive vision, an earth-encompassing vision. It’s almost like a reversal of attitude. Actually, people have always taken themselves for victims hounded by adverse forces – the courageous fight back, the rest lament. But increasingly there has been a very concrete vision of the role adverse forces play in the creation, of their almost absolute necessity as goads to make the creation progress and become its Origin again. And there was such a clear vision that one should accomplish one’s own transformation – that’s what we must pray for, what we must work out – rather than demand the conversion or abolition of the adverse forces. And there was the sudden vision of all the error, all the incomprehension, all the ignorance, all the darkness and – even worse – all the ill will in the earth’s consciousness, which felt responsible for the prolongation of those adverse forces and beings and offered them up in a great . . . it was more than an aspiration, it was a sort of holocaust, so that the adverse forces might disappear, might no longer have any reason to exist, no longer need to be there to point out all that has to change.